As a service to my clients, I help them sell things on the Internet, mainly higher priced items. So I figured I would add another advertising source for them (this page). If you have any questions about anything I have listed on this page, feel free to contact me. I’ve divided the items I am helping to sell into categories, and have listed them below. Each listing under each category has its own page with all of the info about it. Just click on the link for each listing to view its full description and all of the pictures. NOTE: When contacting me, please select which system you’re interested in from the drop-down menu on my contact page so I know which one you are contacting me about (System 1, System 2, etc.). Thanks! 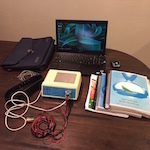 System 39: Quantum Biofeedback INDIGO package with a Quantum Computers Laptop and 3 INDIGO manuals! Includes a Quantum Computers laptop, 3 INDIGO manuals, and a Samsonite rolling carrying case! Also comes with a 50% OFF coupon code for Nirvana Zarabi-Smith’s Biofeedback Certification Training Program! System 1 < – SOLD! Reduced Price: Now Only $6,997! FREE: TWO (2) QuantumCaress Kits with TWO (2) Blue Mats! Also comes with FREE BONUS Training! System 2 < – SOLD! Reduced Price: Now Only $6,497! Includes $3000 in accessories & training! You will get a FREE one-on-one training session with a SCIO expert! System 3 < – SOLD! Reduced Price: Now Only $7,997! Includes over $4000 in accessories & training! System 4 < – SOLD! Reduced Price: Now Only $7,997 $6997! System 7 < – SOLD! Reduced Price: Now Only $13,497 or Best Offer! FREE USB Flash Drive that has a ton of PDFs and Word docs with very valuable information related to health and biofeedback devices! You will get a FREE one-on-one training session with an Indigo expert! System 8 < – SOLD! System 8: Quantum Biofeedback SCIO with a 17 inch Laptop, PLUS a FREE One-on-One Training Session! Price: Only $6,997 or Best Offer! BONUS training comes with this SCIO package, including one that is valued at $500! System 9 < – SOLD! System 9: Quantum Biofeedback Indigo in “Pristine Condition”, a Quantum Caress Kit, an Optional BRAND NEW 17″ ASUS Laptop, PLUS a FREE One-on-One Indigo Training Session with an Indigo Expert! PACKAGE A (WITHOUT a laptop): Only $12,497! PACKAGE B (WITH a BRAND NEW 17″ ASUS laptop + latest version of Indigo software installed! ): Only $14,497! BONUS ACCESSORY: Quantum Caress Kit is included in this economical Indigo package! You will get a FREE one-on-one Indigo training session with an Indigo expert! System 11 < – SOLD! This is our most economical SCIO EPFX package! You will get a FREE custom one-on-one training session with a SCIO EPFX expert! System 12 < – SOLD! System 12: Quantum Biofeedback Indigo with a Quantum Caress Kit, valuable training materials, and a FREE custom one-on-one training session! PACKAGE B (WITH a BRAND NEW 17″ ASUS laptop + latest Indigo software upgrade): Only $14,497! This comes with a Quantum Caress Kit and lots of valuable training materials! You will get a FREE custom one-on-one training session with an Indigo expert! System 14 < – SOLD! This is the most economical SCIO EPFX package I have listed! System 15 < – SOLD! This Indigo package includes SPECIAL BONUS SOFTWARE! System 16 < – SOLD! System 16: Quantum Biofeedback Indigo with over $1500 worth of accessories and bonuses! This Indigo package includes over $1500 worth of accessories and bonuses! You will get a FREE and PRIVATE one-on-one Indigo training session with an Indigo expert! You’ll also get a special coupon code that will give you 50% OFF BIOFEEDBACK CERTIFICATION at The Quantum Academies! (LIMITED TIME ONLY) Click here for more info. System 17 < – SOLD! System 17: Quantum Biofeedback SCIO EPFX with a Fantastic 17 inch Toshiba Laptop that was NEVER USED! This SCIO EPFX package comes with a fantastic 17 inch Toshiba laptop that was never used! System 20 < – SOLD! System 20: Quantum Biofeedback Indigo with a 17″ Quantum Computers laptop, the Indigo Manual, and Nirvana Zarabi-Smith’s A-Z Protocols book! This Indigo package includes a beautiful 17″ Quantum Computers laptop, the Beginners Indigo Manual by The Quantum Academies, and Nirvana Zarabi-Smith’s A-Z Protocols book! System 22 < – SOLD! System 22: Quantum Biofeedback SCIO EPFX with a 17″ Quantum Computers laptop PLUS bonus books, accessories, resources, and training! This SCIO EPFX package includes a beautiful 17″ Quantum Computers laptop PLUS bonus books, accessories, resources, and training! You will get a FREE and PRIVATE one-on-one SCIO EPFX training session with a SCIO EPFX expert! System 23 < – SOLD! 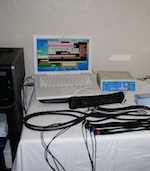 System 23: Quantum Biofeedback SCIO EPFX with an awesome Sony VAIO laptop, 3 SCIO manuals, and BONUS training! This SCIO EPFX package includes an awesome Sony VAIO laptop, 3 SCIO manuals, and BONUS training! System 24 < – SOLD! System 24: Quantum Biofeedback SCIO EPFX with a beautiful 17″ Quantum Computers laptop, 1 SCIO EPFX head harness, 4 SCIO EPFX wrist/ankle straps, and 11 BONUS accessories and training materials! System 24: Quantum Biofeedback SCIO EPFX with a beautiful 17″ Quantum Computers laptop and 11 BONUS accessories and training materials! This SCIO EPFX package includes a beautiful 17″ Quantum Computers laptop and 11 BONUS accessories and training materials! System 27 < – SOLD! Quantum Biofeedback Indigo with VALUABLE BONUSES and Nirvana Zarabi-Smith’s Quantum Encyclopedia! System 27: Quantum Biofeedback Indigo with VALUABLE BONUSES and Nirvana Zarabi-Smith’s Quantum Encyclopedia! PRICE with a BRAND NEW HP LAPTOP: Only $11,097 $10,097! System 28 < – SOLD! and a BUNCH of BONUSES! Price WITHOUT the laptop: Only $5,997! Price WITH the laptop: Only $6,497! This SCIO EPFX package includes a beautiful 17″ Quantum Computers laptop and a BUNCH of BONUSES! If you are interested in one of the Quantum Biofeedback SCIOs or Indigos, email me or call me at 424.354.1141. DO NOT buy a pre-owned biofeedback device BEFORE reading this. Discover the one thing you can do that will drastically decrease the chances of you buying a lemon. They say a picture is worth a thousand words, but the right kind of picture is worth thousands of dollars when purchasing a pre-owned biofeedback device. In negotiations, there is alway some give and take. However, some are deal breakers, and this is one of them! I’ve read this entire buyer’s guide, and in addition to the crucial topics listed above, it covers all of the bases that you should cover when shopping for a pre-owned biofeedback device. If you don’t ask the seller these questions, you could be in for some major headaches that could cost you a substantial amount of money, time, and frustration. To get this powerful buyer’s guide for biofeedback devices, simply enter your name and email address below, and you’ll receive it with in minutes!